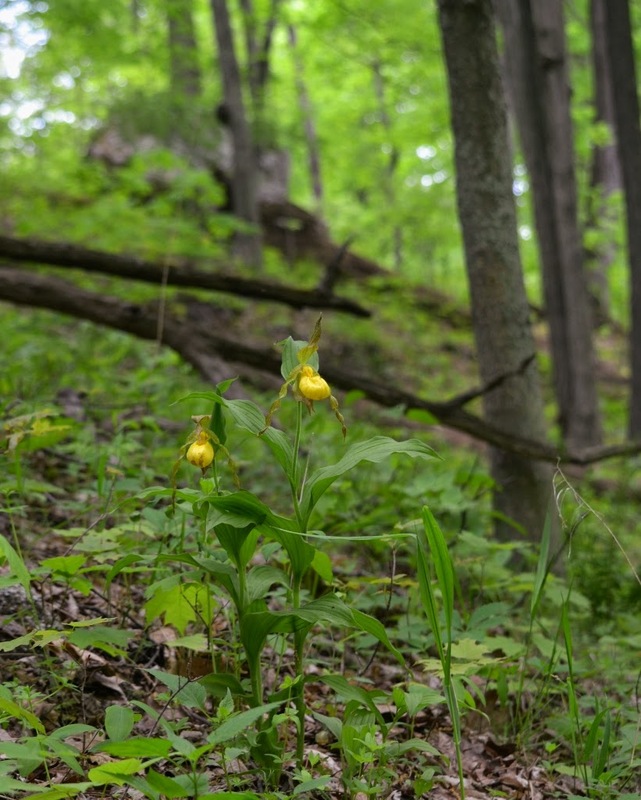 There is at least one place in Pennsylvania where the Yellow Lady's Slippers grow like weeds. Over the weekend, we went on a hike at that spot.... a wooded limestone hillside where these large, yellow, native orchids love to grow. What fun! We noticed the orchids often grew in pairs like the ones in the photo below. The orchids sometimes grew in clusters. Sometimes the yellow orchids grew singly. This lone Yellow Lady's Slipper isn't really alone. I can see about five or six other flowering orchids in the background. I could see about a dozen of these bright yellow orchids from the spot where I took the picture. My regular readers know I am fascinated with orchids and the variety of tricks they play on bees. Each kind of orchid seems to have its own method of bamboozling bees during the pollination process. 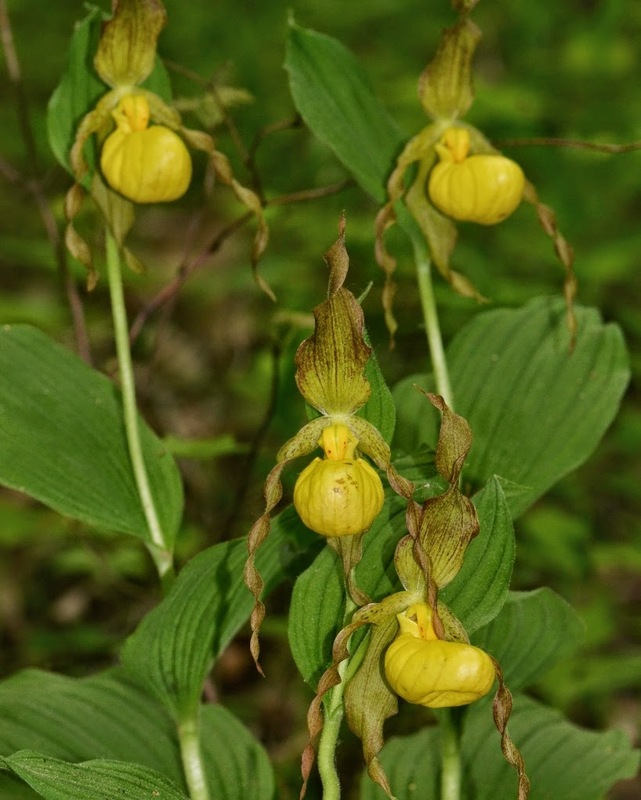 The Yellow Lady's Slipper orchid uses a trap-and-funnel pollination mechanism. The trap is the pouch, or slipper, of the orchid. 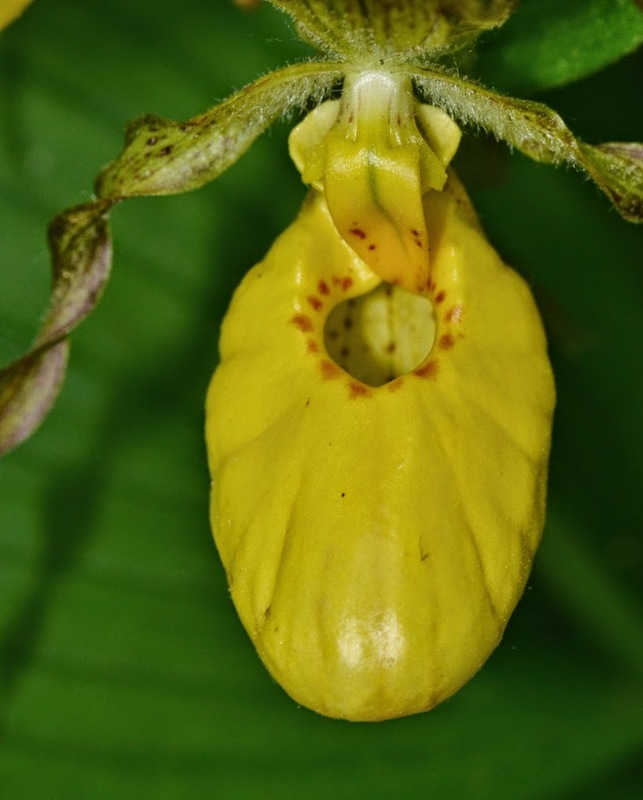 When a bee (or bumblebee) is attracted to the orchid by the bright yellow color and/or the faint, pleasant smell, it finds a convenient hole where it may expectantly drop into the roomy yellow pouch. You guessed it! The yellow pouch is all "puff"... it is an empty, reward-less trap. 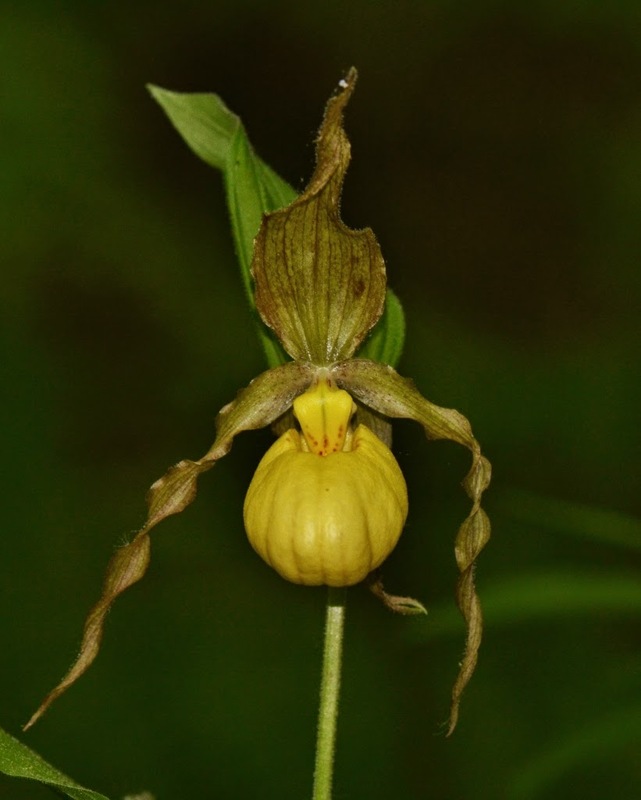 Here is another photo of the orchid's bee trap... doesn't it truly look like a slipper? The pouch is designed to make escape difficult... at least if the bee tries to fly, or scramble, out of the hole it entered. Eventually, the bee finds a tunnel to crawl through to exit the orchid. 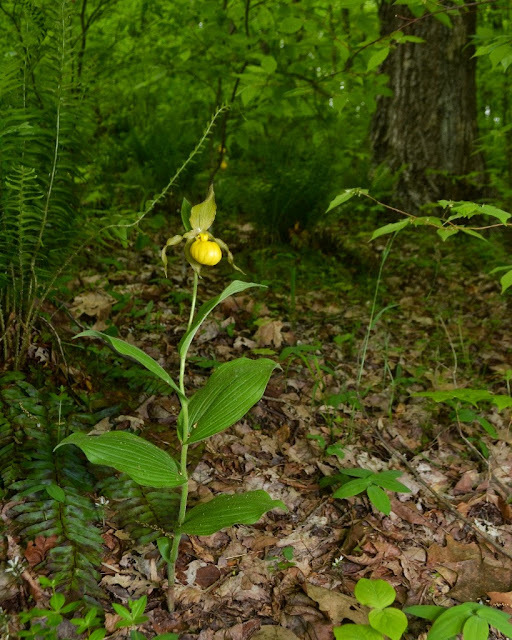 As the bee navigates the short tunnel, it first get its back "swept" by the stigma for any pollen from a previous Yellow Lady Slipper visit. Then, right at the exit, a sticky pollinium is stuck to its back for the bee to transport to the next Yellow Lady's Slipper. Can you picture how that pollination system works by looking at the picture above? 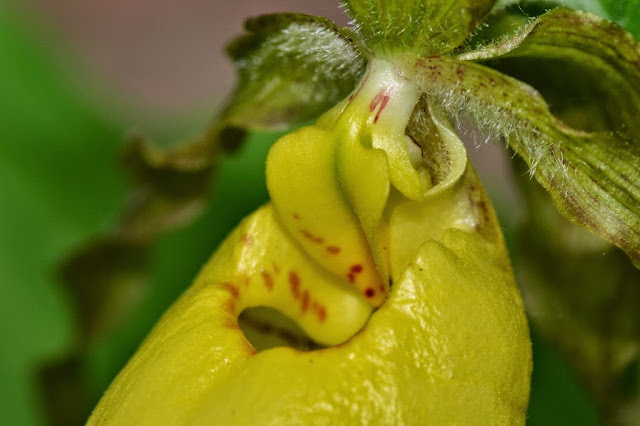 See my post about the Pink Lady's Slipper and my diagram of that orchid's pollination mechanism. 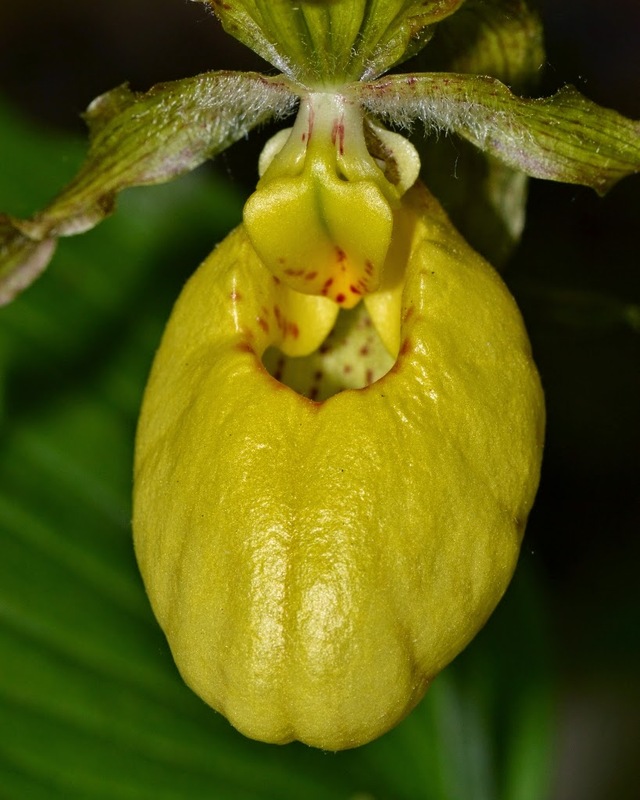 The two orchids use a similar system... the difference is... the Pink Lady Slipper uses more of a trapdoor for an entrance into its trap, while the Yellow Lady Slipper uses what I call a "well". 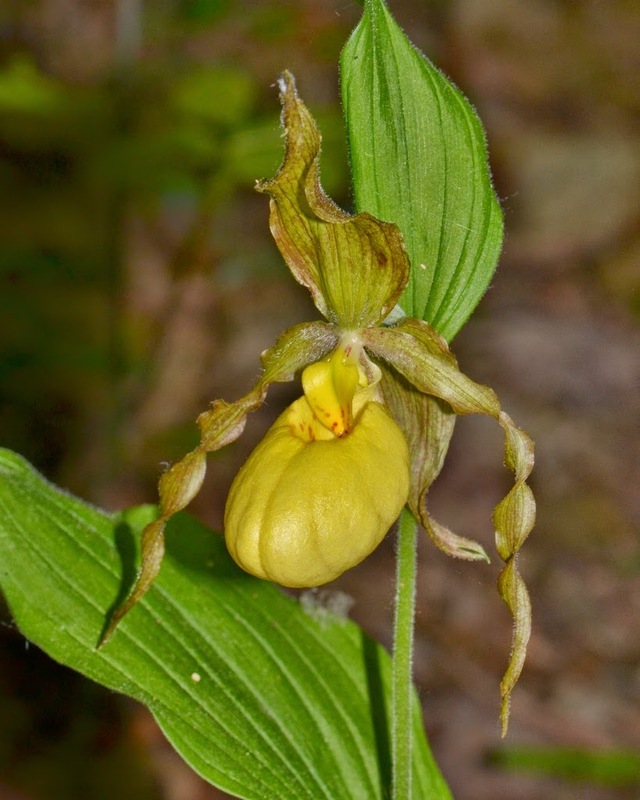 I hope some bees repeatedly "fell" for the Yellow Lady Slipper's traps this year. Up next are some little orchids, the Showy Orchis (Galearis spectabilis), that were growing at the bottom of this hill. From seeing some distribution maps, it looks like you do have the yellow orchids in your area. 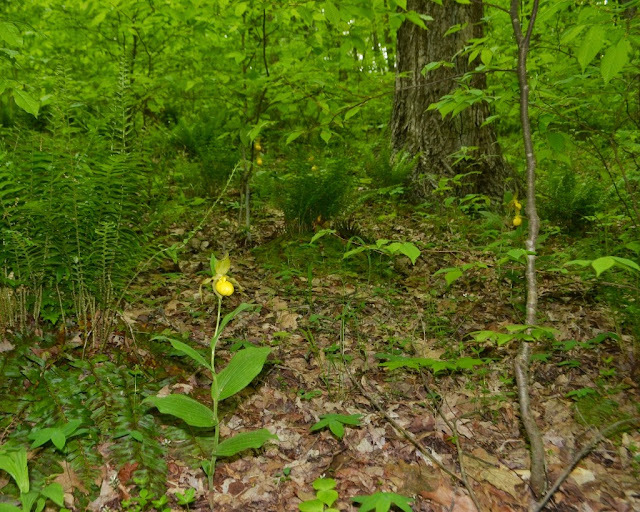 The Yellow Lady Slippers seem to like a different sort of soil or habitat than the pinks. In a week or two, try hiking a woods where limestone (gypsum) rocks lay around on the surface... maybe you will see some. There are also Yellow Lady Slippers that like bogs and wetlands.